Being Retro: A Giveaway from "Neatorama"
01. ENTER HERE [COMMENTS] - Tell me why you want it (and email address)? 02. 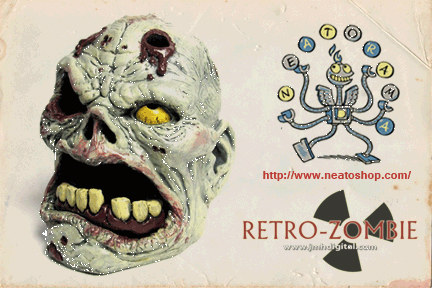 LIKE THEIR FACEBOOK [CLICK HERE] - Tell them that "Retro-Zombie" sent you! 03. ADD ME AS A FRIEND - Retro Z loves friends... if you don't yet! 04. TELL SOMEONE YOU KNOW - Yes, I know just make a mention on your site. Do as many as you can, more people... more giveaways in the future! Winner will be contacted by email and product will be sent by "NEATORAMA"
Now the future depends on you, so if you love zombies... enter now... don't let me down! THAT is AWESOME!!!! I wanna stick pencils and clips and letters and bills and all kinds of schtuff in it!! I liked their facebook page, but how do I add you as a friend? this is a cool thing, i ordered one.. and thought you all might one... you are all ready following me, no worries. I'll definitely plug it in my next rounds of news, Jeremy! just do as many as you can... commenting is the first thing... done. Using this to organize my school supplies would be awesome. This will fit perfectly with what I'm already saying today, which I'm in the middle of writing, and I ended up here...so you might guess what I'm writing about...and you'd be right. I'm doing a shout-out to my favorite Zombie in conjunction with showing off my new spring blog outfit! If I win the pencil holder, it will be a gift to my 14.9 year-old zombie loving, zombie hunting, zombie-son, Jake. I like that they have a juggler logo. I love love love the "Walking Dead" series on t.v. I am a sci fi fanatic so I feel at home here. Accept age wise. I'm sure I could be your grand mother. Oh well, just goes to show you once a zombie head always a zombie head. Thank for the A-Z banners and cool stuff, some (ok all) of which I'm still trying to figure out. I'll be back! Not trying to win the zombie holder (my 3-year-old would never sleep again) but just wanted to say nice job on the banners for Alex and Arlee! Got skills man. Hello from a Fellow A-z 2012 member and thanks for making this years a visual feast with so much art work. My first time commenting on your blog, but I couldn't have picked a better time. I could use a a place to stash decomposing fingers --I mean pencils. Yeah, pencils. 01. Who wouldn't want a zombie head that holds your stuff?! 02. Liked them and said I was sent by you! 04. I shall mention it on my Facebook page! My son would love this and it would be an unexpected treat he can keep in his room because it is really creepy. He loves zombies! this would be cool in my hard on halloween & in my bedroom after .